The current economic downturn continues to take its toll in both industrialized and developing countries. According to a report from UN Special Rapporteur on Adequate Housing Miloon Kothari, nearly one billion people around the world lack adequate housing, and approximately 100 million people have no housing of any kind. Recently, there have been efforts to spotlight the plight of society's most vulnerable members. TakePart.com is a cause-related site designed to help explore today's pressing issues using video, images and audio, and added actions to make a difference such as signing a petition or educating the community. Their latest video is called Beth's Story, which looks at homelessness. "Beth's Story, was created to shine a light on the millions of people living on the street who are often times overlooked, said TakePart.com organizer KC Webster. "She is a composite of their many complicated, often heartbreaking realities and of the issues and challenges lead to homelessness." It is too early to tell the ultimate impact of the campaign, but so far, success has been made. Beth's Story has also been promoted on TakePart's blog, Twitter feed, text messaging and YouTube account, each tool has a few hundred followers supporting the cause. only exposed to numbing statistics, each individual number has a story," Webster said. Good news out of the White House today. No, not that news, this news. Some of the $4 billion from President Barack Obama's $787 billion economic stimulus plan that was budgeted to renovate public housing will be spent to create so-called "green jobs" by making the dwellings more energy efficient. E&E: You've advocated "greening the ghetto" in the past; how much of the $787 billion economic stimulus will go toward greening inner cities, and where will the money go? Jones: HUD has somewhere in the neighborhood of $10 billion to do energy-efficiency retrofits and weatherization. I know [HUD] Secretary [Shaun] Donovan is going to be passionate about getting that money spent well. But I'm not in a position now to comment on all of the details, the particulars of how the various agencies are planning to spend the money. E&E: A Rutgers University report published today suggests that most green job openings will not be new occupations, but rather traditional occupations with a new layer of "green" skills and credentials. For example, laborers and building contractors who need specialized training and certification to perform home weatherization audits. Do you agree? Jones: Yes. That's one of the exciting things about this. Sometimes people think we're talking about some exotic occupation from Mars that nobody's ever heard of. That we're talking about George Jetson or Buck Rogers when we're thinking about green jobs. We're not talking about solar ray-guns; we're talking about caulking guns as one of the major tools we're going to need to be smarter with energy. Those are jobs our existing work force, with a little training, can start doing right away. E&E: Going forward, what role should the private sector play with regard to creating and keeping green-collar jobs? Jones: The president has made very clear that he wants the majority of these jobs to be private-sector jobs. I think that's appropriate. Entrepreneurship, innovation and the free market will solve a lot of these problems. We just have to get the rules right and get the supports in place so our new industries can take off. Since Barack Obama's ascension to the White House, there has been a spur of interest online to follow the light-hearted sides of his historic presidency, while providing serious commentary on the administration's policy decisions. Jounrnalist and self-described “ag policy wonkette” Eddie Gehman Kohan founded her popular blog Obama Foodorama to discuss all things related to the president and food, "one bipartisan byte at a time." In a previous interview, she said she does the blog because "everyone eats," and "if you can't find something to personally relate to in the panopoly of continents, races, time zones and family situations that created Barack, there's always food," she said. "[Obama's] competing reputations as both a comfort food lover, a junk food addict and a gourmet make him highly accessible no matter what the entry point." But don't expect to just read posts about last weekend's White House Correspondents' Dinner or what the Obamas eat on their night on the town, Obama Foodorama has become one of the leading blogs on food justice and advocacy. In addition to blogging about the finer side of dining, Gehman Kohan has also created a following on her blog and her tweets because of her funny yet indepth discussions about the administration's agriculture policy, food safety and food-related health problems. Some recent posts have been on first lady Michelle Obama's ground-breaking organic garden, Green jobs advisor Van Jones' plans for a greenroof garden on top of the White House and the recent protest by African American farmers calling on the president to redress years of racial discrimination. 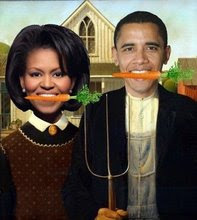 According to Gehman Kohan, Obama has inherited a global food crisis. "Immediate changes are needed in the way CDC, FDA and USDA work together during disease outbreaks, as well as the need for appointing not so much a food safety "czar" as a food safety "mentor" to coordinate the activities of the three agencies. We're in the middle of a period of terrible economic downturn, which leads to both hunger issues and grocery bill issues, and we're trying to figure out a new energy policy, which is directly related to the use of varying kinds of ethanol...which is directly related to food crops. Also, sadly, the US is the biggest importer of Chinese food products in the world, and the Chinese make the most dangerous food products in the world. The issues on the blog affect everyone whether they're an official "foodie" or not. Eventually the blog may turn back into what the tagline claims -- a daily diary, one byte at a time -- a historic, electronic document of Barack and food. Right now, we have all kinds of interviews scheduled with foodie thinkers and food/farm activists, chefs and restaurateurs, as well as guest posts from other bloggers, in addition to the usual fun Chowbama gossip..."
The real story behind the swine flu? Bob Gottlieb, professor of urban and environmental policy and director of the Urban & Environmental Policy Institute (UEPI) at Occidental College, spoke to the fellows yesterday about food as an environmental justice issue. 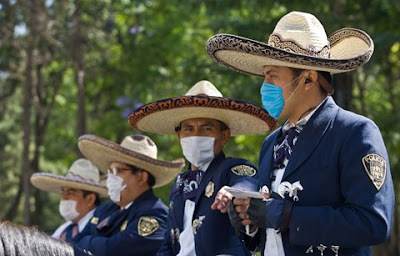 He alluded to the recent discussion in the food justice community about the possibly origin of swine flu, and the reluctance to discuss it public. Below might give some insight into this issue. Today, amid increasing international concern about the global swine flu outbreak, Food & Water Watch urged leaders of the U.S. Senate and House agriculture and health committees to investigate the serious human health problems caused by industrialized pork production. The national consumer advocacy organization submitted a letter to Chairman Edward Kennedy (D-MA), Chairman Tom Harkin (D-IA), Chairman Henry Waxman (D-CA) and Chairman Collin Peterson (D-MN), asking their respective committees to hold hearings examining the source of the swine flu virus, the pathway for transmission between hogs and humans, and the conditions inside factory farms that could foster the growth and mutation of the influenza virus into more virulent strains. Food & Water Watch warned of other potential threats to human health, including the discovery at U.S. hog facilities of Methicillin-Resistant Staphylococcus aureus (MRSA) – the difficult to treat staph infection – and antibiotic-resistant E. coli on operations using non-therapeutic antibiotics. Van Jones, President Obama's green man and author of the best-selling book, The Green Collar Economy: How One Solution Can Fix Our Two Biggest Problems, is the hot man of the moment. Not only is he leading the way for the "Green New Deal," through his work with Green for All, he has also inspired his boss to grow food on top of the White House - literally. The White House is undergoing green renovations right now, and Ob Fo hears that in the future, there'll be a greenroof food garden, as the White House explores new ways of highlighting environmental stewardship, alternative agriculture solutions, and job creation. A "greenroof" is a roof made with vegetative cover, with growing media and plants taking the place of roof tiles, shingles, or gravel. In urban areas, a greenroof improves air quality, helps lower over-all air temperatures, and can prevent toxic rainwater runoff from getting into local watersheds. They're also an excellent form of insulation. I'm just lovin' that a brotha is doing all this! Best of luck to him! Although the official theme of this year's World Press Freedom Day is "media and dialogue," it should really be "resilience." The courage of many of my colleagues who risk their lives to tell the story never ceases to amaze me. Moussa Kaka, the director of the private radio station Saraouniya Radio talks about his coverage of the Niger Justice Movement that led to a one-year imprisonment. Mohammad Al-Al Abdallah, a 26-year old Syrian blogger, reveals his family hardships that have arisen from the fight for press freedom. In Yemen, Abdel Karim Al-Khaiwani, talks about spending a year behind bars for his reportage on high-level corruption, nepotism, and human rights abuses. Colombian journalist Claudia Julieta Duque discusses the long battle she has faced for her investigative reporting. Barry Bearak of The New York Times describes his arrest, detention and expulsion from Zimbabwe for trying to report from the country during the last elections. This year, we should also keep in mind freelance reporter Roxana Saberi who was recently convicted in Iran for spying, and Current TV correspondents Laura Ling and Euna Lee still being detained in North Korea for entering the country illegally. On the first day of the E.J. fellowship, we got a crash course on the subject by Johns Hopkins University professor Eileen McGurty, author of the book, "Transforming Environmentalism: Warren County, PCBs and the Origins of Environmental Justice." In 1978, residents of the predominately black Warren County in North Carolina were devastated when they learned that the state planned to build a landfill in their community to hold forty thousand cubic yards of soil that was contaminated with PCBs from illegal dumping. The community responded to the state’s plans with a four-year resistance, ending in a month of protests with over 500 arrests from civil disobedience and disruptive actions. Today, there are calls again to make the green movement "black" again. ...But there is another trend, too. Black is the new green. The American environmental elite is an increasingly racially diverse place. President Barack Obama appointed sister Lisa Jackson to head the Environmental Protection Agency. He tapped grassroots, green-jobs brother Van Jones as special adviser to the White House. 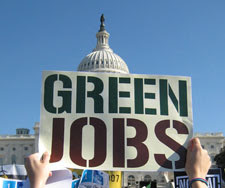 And his Labor Secretary, Hilda L. Solis, is a Latina with a record of championing green jobs and environmental justice. Black women like Majora Carter and Beverly Wright are at the forefront of regional environmental advocacy. And in his chairmanship of the National Wildlife Federation, Jerome Ringer has integrated even the conservation arm of environmentalism, which is historically devoid of racial minority leadership. Even the first lady is encouraging kitchen-table environmentalism with her advocacy of local organic food and home-based gardening. With this growing diversity of green leadership, it is harder than ever to claim that America’s racial minorities care little about environmental issues. For decades, ordinary citizens of color have become environmental activists when they organized to resist the toxic waste dumps in their neighborhoods, to force regulation of polluting industries in fence-line communities, and to bring attention to the negative health impact of particulate emissions near their homes. But these largely decentralized, locally led movements were rarely understood as central to the conservation and climate-change environmentalism that dominated federal policy and the national imagination. So despite their efforts, the contributions of black, brown and poor communities have often been ignored in the story of a greening America. Despite President Obama's efforts to make the country more sustainable, one of the first major complaints about his green policy seems to be coming from other black environmentalists. The National Black Farmers Association (NBFA) and the Congressional Black Caucus (CBC) say Barack Obama led the charge last year to pass a bill allowing black farmers to seek new discrimination claims against the Agriculture Department when he was a senator. NBFA also says that as president, his administration so far is acting like it wants the potentially budget-busting lawsuits to go away. John Boyd, right, head of the National Black Farmers Association, which has organized the lawsuits cannot figure out why the president wouldn't want to implement a bill that he fought for as a U.S. senator. NBFA notes that Congress has bailed out Wall Street auto makers and America's top banks. At issue is a class-action lawsuit known as the Pigford case. Thousands of farmers sued USDA claiming they had for years been denied government loans and other assistance that routinely went to whites. The government settled in 1999 and has paid out nearly $1 billion in damages on almost 16,000 claims. Farmers, lawyers and activists like Boyd have worked for years to reopen the case because thousands of farmers missed the deadlines for participating. Many said the filing period was too short and they were unaware of the settlement until it was too late. The cause gained momentum in August 2007 when Obama, then an Illinois senator, introduced Pigford legislation about six months into his presidential campaign. Although the case was hardly a hot-button political issue, it had drawn intense interest among African-Americans in the rural South. The proposal won passage in May as sponsors rounded up enough support to incorporate it into the 2008 farm bill.